BROOKLYN, NY (OCTOBER 4, 2018) — The Independent Filmmaker Project (“IFP”), the nation’s premier member organization of independent filmmakers and storytellers, and Verizon’s RYOT, a premium entertainment studio, (“RYOT”) announced today the launch of a new initiative focused on new storytelling forms developed exclusively for the 5G mobile network. IFP and RYOT will host a public discussion to showcase the technology and concepts that creatives may employ in developing the next generation of stories over 5G. This event will take place on October 18th at the Made in NY Media Center by IFP and will outline the format and timeline of the initiative, including an open call for submissions, lab intensive, and a robust LA and NYC-based residency program. To facilitate this step forward in 5G storytelling, RYOT recently announced the opening of a new production facility to serve as a hub for experimentation with new storytelling forms that leverage Verizon’s Ultra Wideband 5G network. Located alongside Verizon’s 5G Lab on its Playa Vista campus, the new RYOT Innovation Studio will play a central role in the residency phase of the Next Generation 5G Storytelling Initiative. The facility will provide storytellers access to Verizon’s Ultra Wideband 5G network and opportunities to experiment with augmented and mixed reality, volumetrics, CGI, motion capture that will have a wide range of applications using the next-generation standard in mobile telecommunication. 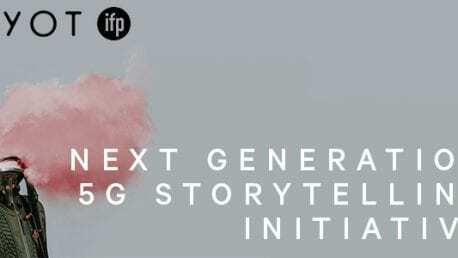 Submissions for the 5G Next Generation Storytelling Initiative will be accepted by IFP beginning October 10, 2018, with all submissions due by November 16, 2018. Creative teams will be encouraged to propose ideas with ambitious scopes and conceive of form factors distinct from what has historically been possible, including new types of graphics and interactivity. Ten (10) projects will be selected to participate in a lab intensive at the Made in NY Media Center later this Fall. Following the intensive, three (3) final projects will be invited to further develop and produce their projects, using RYOT’s facility and technical resources, and benefitting from guidance and regular workshopping with the Verizon and IFP teams. Entries can be submitted here: https://nymediacenter.submittable.com/submit. RYOT is Oath’s Emmy Award®-winning, Academy Award®-nominated premium entertainment studio that produces both feature-length and short content in traditional and emerging immersive formats. RYOT has produced a range of cutting-edge film, television, and immersive projects with festival premieres at Sundance, Tribeca, SXSW, and Hot Docs among others. RYOT’S films can be seen on HBO, Showtime, Netflix, Hulu, ESPN, National Geographic. Highlights include back-to-back Academy Award® nominations for Best Documentary Short Subject for the non-fiction shorts “Body Team 12” and “Watani: My Homeland,” and this year RYOT became the only media company at both Sundance Film Festival and Tribeca Film Festival to have content premieres across every category and format.